I got myself an electric guitar. I'd always wanted one as a teenager. I never really stopped wanting one. I bought one online several weeks ago. When it was delivered to the doorstep, my heart was pounding. I ripped open the packaging, set it aside, and planned to play it that night once I had gotten all the responsibilities of the day over with. That afternoon, I was cutting some dried fruit with a dull steak knife (bad idea) which slipped onto my finger. It tore open my fingernail so deep that it even ripped into the skin underneath. As blood came rushing up to the surface, the first thought I had before "Should I call 911?" was "Now I can't play my new guitar!" This week it finished healing so I finally got to play. 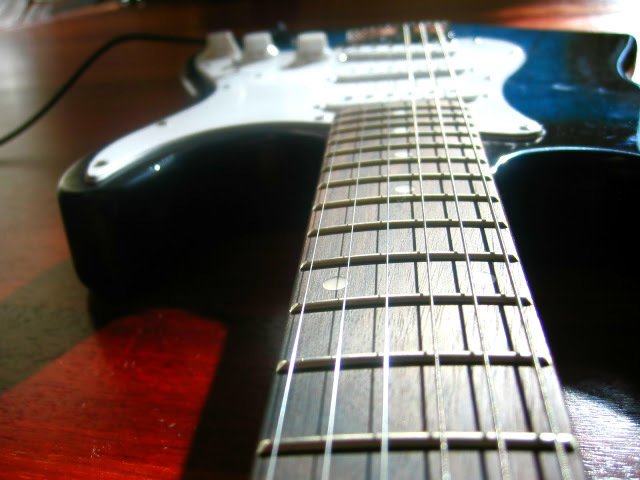 I had taken a semester of guitar in college and I used to have a classical guitar, so I can do some basic chords. That is what inspired me. That is why I wanted to play the guitar - to be a part of all that. U2 was my favorite band then, and still is now. Tonight, when the sun goes down, I'm going to take out the sheet music to The Joshua Tree. These songs were the background music to my life, and to the lives of so many Gen Xers. Tonight I'm going to play the songs I have loved with all the intensity that I felt when I heard them for the first time, the second time, and even the thousandth time. 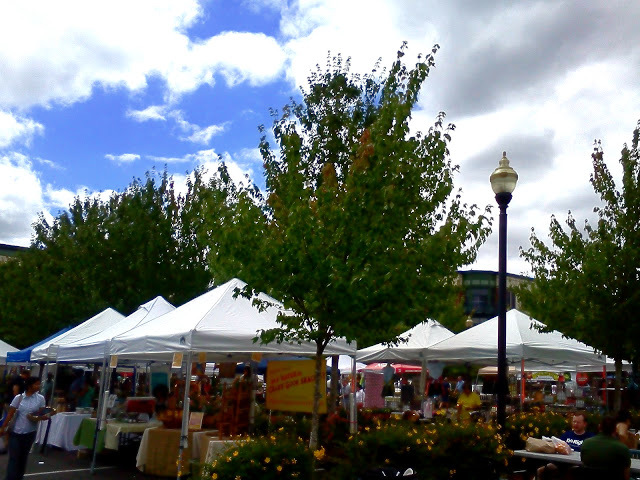 After all this talk in my recent blog entries of things like farm-fresh berries and sunshine, it's now time to talk about blue donuts eaten in dark parking lots. A certain blue donut is demanding that its story be told. Call it a metaphor. Or just call it a donut. A long while back I was having this intense craving for blue food. I had passed by the bakery of the grocery store several times on several different days trying not to give into the temptation of the donuts with blue icing. For weeks, anytime I saw something blue, I was overcome with the need to consume blue food. I had just decided/announced that I was going to eat way healthier, which meant donuts were not on the menu. Once again, I was at the grocery store when the donuts were, once again, seductively calling out to me, and I realized it was actually a psychological thing drawing me to the blue icing. I needed to see what unknown road this was going to take me down and I gave in. Because I had made a big announcement about my eating changes I realized I'd look like a liar unless I hid and ate my donut in the car of the dark parking lot of the grocery store where this blue thing had forced its way into my life. I ripped open the little paper bag it came in, and rain started spitting down from the sky. The street lamp above started sputtering its light. 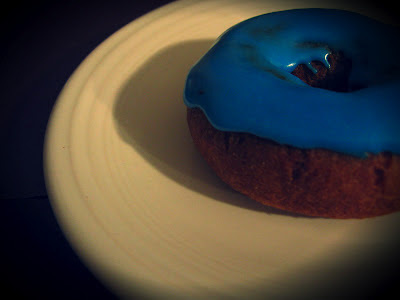 I was in a film noir and the only part that was in color was the blue donut. I bit into my donut. I closed my eyes in a state of bliss. The taste took me directly back to some birthday party in 1st grade that I hadn't thought about in years. I had been so happy that night - I had loved my classmates and the whole class was invited - no one was left out. I was in this really great class where everyone got along and being together having fun created such a happy energy. In the dark parking lot thinking back on this, I realized that being at this party was as happy as I ever was in this life. At that party, the birthday boy had a cake with blue icing on it. I was still fully myself during this time of my life, before so much of my true self evaporated. We all start out fully ourselves before we get told to act differently, before it matters what brand of clothes we wear, before we think we have to do all these different things to fit in, to please people. Before people tell you that you are not good enough. 1) I need to get back to enjoying life more fully and surrounding myself more with things that make me happy. 2) I want to reclaim the sense of humor I used to have. Parts of it remain, but I need to get the rest of it back. And you...what rules are you following that you don't really believe in? When your conscience warns you that you are not being true to yourself because you are placating the powers-that-be in your life, you need to go find your blue donut. I am much closer to my blue donut now, to my true self, than I was on that rainy night in the parking lot, but I am not as close as I was that night at the party in the 1st grade. ...the person you really are. Happy conversation and the sound of live music in the background. The sizzle and scent of barbecued bratwurst. The gentle sunlight on the red skin of the tomatoes. Flower bouquets in every hue of pink and purple sharing their scent to the the passers by. Local artists displaying their work, their genius, to the world on canvas. Small homemade soaps in soft colors wrapped in brown paper. 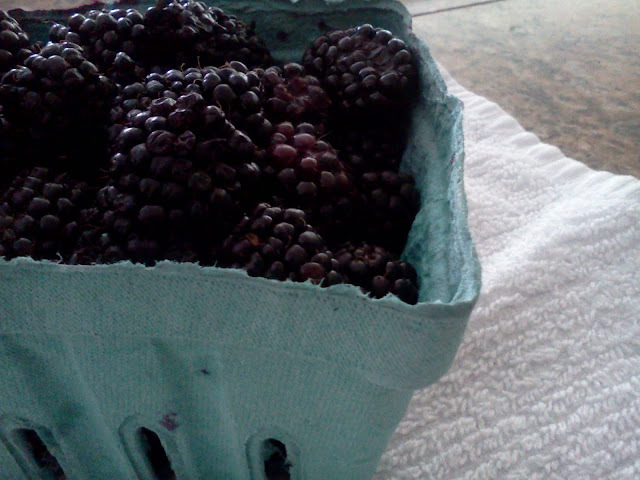 Small golden raspberries hiding shyly behind colossal black marionberries. All this beauty from the rain, the sun, the soil, our hands. In the 1970s, it was no big deal for kids to play outside all day without checking in with parents, to take trains to places across the city, or to spend a lazy afternoon picking flowers in meadows. Then, during the 80s, most kids had to leave their sandlot for their basement rec rooms to play video games because the world seemingly had turned into a scarier place. In the very early 80s, as a small child, I remember running around our neighborhood with my next-door neighbor. This pack of teenage boys would fly by on their skateboards making their usual neighborhood rounds as we'd head to the park. Then, one day, we were told not to go to the park on our own anymore. A lot of the memories of older Gen Xers are of nature, of breathing fresh air, and of running back and forth to any place they felt like. Many of the memories of younger Xers are of just basically being inside. As patterns are set and traditions are formed for my daughter's childhood, I am trying to reclaim the outdoors as a part of weekend and even everyday life. This is why the last two entries were about park festivals and outdoor picnics. We also want her to experience local Farmer's Markets -- to remember the pink and purple flowers of her childhood summers along with the yellow squash and orange pumpkins of her childhood autumns. is exclaiming, "picture yourself here! ", which is the heart of the Fireflies at Dusk Project. Experiencing the fullness of summer requires spending as much time as possible outside. My family and I spent a warm afternoon at a park festival that happens in our city every year and after getting lunch, I could hardly wait to get over to the bouncy house section. Whether you are the one bouncing or the one looking inside to watch others do the bouncing, I really cannot imagine a place happier than a bouncy house. 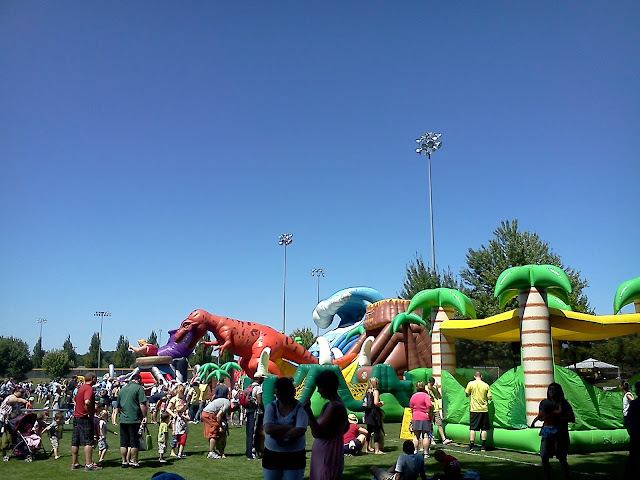 I find bouncy houses to be an iconic piece of the childhood of Gen X. No matter how good or bad you are at sports, or at school or anything else, we all become equals in the bouncy house. This is because there is no score, no competition, and really there no wrong way to jump. The higher you jump, the harder you bounce and the higher everyone else jumps, too. It would be very hard not to smile in a bouncy house.